Did the above headline fill you with dread? The good news is, you are not alone. According to new research, more than half of us will avoid going to the pool this summer, because of body image issues. How depressing is that? It’s a sad sign of our times that four out of five women admit to putting their bodies down through ‘fat talk’. A third of us have only negative things to say about their bodies, and another third badmouth themselves on a daily basis. In a bid to change how we feel about our bodies and encourage more women to take the plunge this summer, Speedo have appointed sports TV presenter Gabby Logan as Speedo Sculpture ambassador. 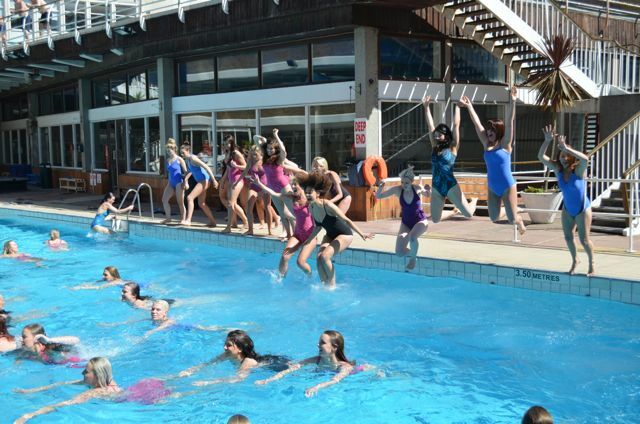 On the 4th of June, Gabby led a group of 40 women in the ‘Parade to the Pool’. The walk (in bathing suits!) from the Covent Garden store through the streets of London to a local pool had been completed by a marching band, ticker tape and full fanfare. A psychologist had coached the women taking part before they donned their Speedo Sculptures to strut their stuff. Don’t overthink things! When you overthink you’re more likely to stop yourself doing something. Throw off your towel and parade to the pool instead! Manage your expectations of being judged. Most people aren’t looking anyway! More tips on how to stop ‘fat-talk’ from Anjula Mutanda will be available on the Speedo Sculpture Facebook page. As a special treat, I am giving away one Speedo Sculpture bathing suit. You don’t have to take part in a parade to win it – just let me know where you are going to wear it this summer. The winner will be drawn at random; draw closes on 14th of June, 2PM. And the winner is: Margarita from Hazel Daydreams. Congratulations, lovely! Comments are now closed. I’d wear at our local Badi. Weather permitting, of course. i think the fake until you make it is so true…i feel like overall if a girl is confident i admire that way more! some skinny girl looking all awkward and shy in a swimsuit makes me cringe – but if someone like me is owning it…i’d rather be them! Great post about positive thinking, I often over think things and don’t end up doing them! I like what u write about. Having had twins ( instead of “just”Baby Nr.2…!) three months ago, I have thought about (celeb)post-baby-bodies that are all over the Media & felt more and more angry about the pressure that is being on female bodies. even if u have just had a baby you should YES be a (successful working ) mom but NO, not allowed to have a body that had hosted months of pregnancy&breastfeeding. I would wear the Badeanzug next week in our holiday in the Family Hotel in the Dolomites and later on in Innsbruck! Thanks for your strong, honest female-supporting Voice in that MediaJungle! I’d wear it in the paddling-pool! Chance to get out and swim on my own is something that doesn’t often happen or I’m too exhausted to go in the evening. So I mIght also wear it at Toddler Splash! Top post! I’d wear my swimsuit when I take my baby for his first swimming lessons. I hate to go to the pool for this very reason, but my children won’t let me get away with it! I try to take on the Italian idea and just be proud of the body I have. You see all shapes and size of woman in Italy wear bikinis and they don’t try to cover it up! I would wear it with a spring in my step and a smile on my face. Great campaign we were part of-love Speedo’s swimwear and more so, their attitude and ethos! Oh so true, I hate wearing a bathing suit.. great article.